Yes, again already. I can’t really justify doing a whole new review for this, but I felt the need to at least record that I read it again and loved it just as much — loved the characters, giggled, got embarrassed for them, wanted to just high five someone when they did awesome things. 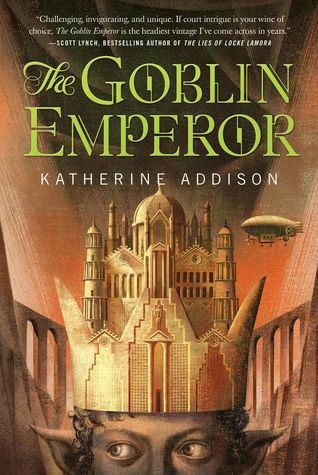 This book is up there among my discoveries of Robin Hobb, Scott Lynch, N.K. Jemisin, Guy Gavriel Kay… I believe it’s Hugo eligible, and I’m pretty sure I’m going to vote again this year for the sake of this book. I like a lot of the things it doesn’t show us face-on, too. The complexities of Setheris’ character, his relationship with his wife; Maia’s father, and the fact that despite his neglect of Maia, his court love and respect him; the lot of the more common people which we only glimpse by hear-say; the Great Avar’s court and his relationships with his family. While it’s a rich world, it goes much more for immersion than for infodumping. And if you begin it confused, well, so does Maia; he’s been kept away from most of this society for most of his life, so he’s in the same boat. I can understand, objectively, that this book is not for everyone. Even some people whose tastes I share quite closely. Subjectively, though, if you don’t like Maia and his struggles, I don’t know if we can be friends. This sounds really cool. I like the idea of the blend of Western Court politics and Eastern religion. I love fantasy and this seems like one I would like. thanks for the review! I really, really love it. I hope you enjoy it if you pick it up! *makes note of book* that sounds fantastic. It is amazing. It basically rocketed right to the top of my favourites list. Psst — check your email. The one I usually send stuff to.